In one of the most famous Christmas carols, “Let It Snow!” the white powder doesn’t want to stop falling. The same appears to be true fir at least one distant alien star. Only, this snow is unlike we have here on Earth. Where Earth’s snow is composed of water ice particles, this one is largely carbon monoxide (CO) ice. 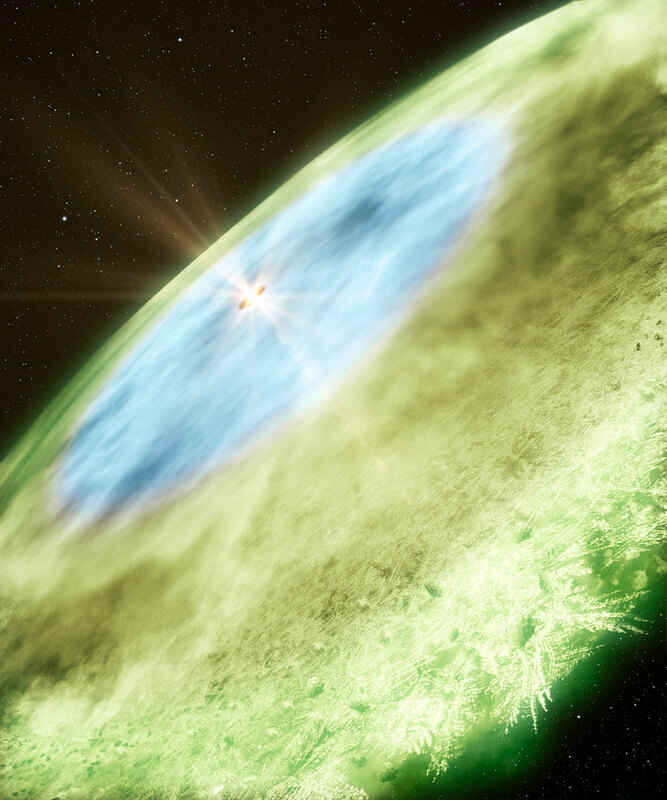 Thanks to the July 2013 discovery of a CO snow line around TW Hydrae, a young star 175 light-years away from our planet, scientists may be able to learn more about the formation of planets and comets. 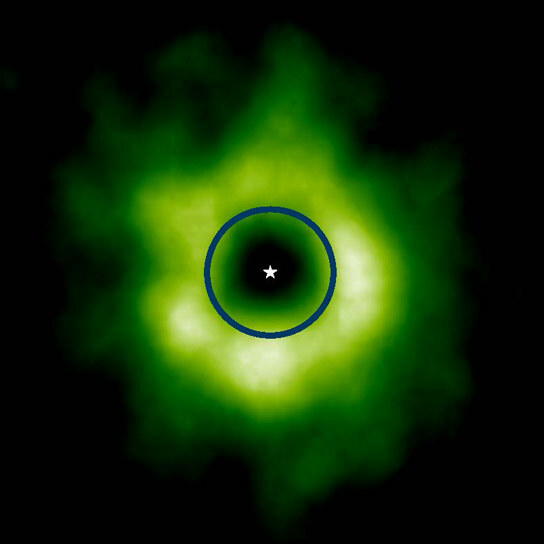 “This is the first unambiguous evidence of a snow line in the disk around a young star, a solar nebula analog. Before the discovery, it was rather a theoretical concept. Now confirming the existence of this important snow line, we can explore the role of snow lines in the formation and chemical make-up of planets around young stars with confidence,” Chunhua “Charlie” Qi, a researcher at the Harvard-Smithsonian Center for Astrophysics (CfA), and a member of the team that made the discovery, told FQTQ. Scientists believe that this snowy feature plays an essential role in the formation and chemical make-up of planets around a young star. They presume that the TW Hydrae system consisting of a star and a gaseous protoplanetary disk, has many of the same characteristics that our own solar system had in its infancy. “TW Hydrae is one of the closest young stars which hosts a massive disk, similar to our own solar system when it was just a few million years old. It remains as one of the best targets to study the dust and gas, the building blocks of planets and comets beyond our solar system,” Qi said. When it comes to the formation of planetary systems, snow lines help dust grains overcome their normal tendency to collide and self-destruct by giving the grains a stickier outer coating. Since there are multiple snow lines, each may be linked to the formation of specific kinds of planets. In a planetary system like our own, the water snow line would correspond to a distance between the orbits of Mars and Jupiter, and the carbon monoxide snow line would correspond to the orbit of Neptune. Moreover, the presence of a CO snow line could have greater consequences than just the formation of planets. Carbon monoxide ice is needed to form methanol, which is a building block of the more complex organic molecules, essential for life. Qi believes that simple organic molecules like methanol and formaldehyde, can form through the hydrogenation of the carbon monoxide ice on grain surface so their distribution could be related to the location of the CO snow line. The team plans follow-up observations of TW Hydrae and other similar intriguing star systems. They hope that future observations will reveal other snow lines and will provide additional insights into the formation and evolution of planets. So, even if the weather out there is frightful, but the starry sky is so delightful, and since we’ve no place to go, let the carbon monoxide snow, let it snow, let it snow! How Do Astronomers Name Celestial Objects?